Near Camping le Moulin du Pont d’ Alíes, in Aude, you enter the car park of the Castle of Peyrepertuse. We suggest you ask the audio guide for a tour of the castle, by a narrator that immerses you in the history of the Cathars. The video shows you the ascent to the castle by a steep path through the forest and arrives at a mountainside, along the walls, offering magnificent views of the Pyrenees. Arrived at the castle, visit the various courts and halls of the castle in two high and low parts. You will discover all the elements of a Cathar castle : the scuppers , the curtain , the ramparts , battlements , the dungeon, the parapets , the watchtower with its deadly … You will be unbeatable ! The kids will love it too ! Access the lower part to the upper part of the castle is made by several trails including one that runs along the wall with a breathtaking view over the valley of the Aude , then you will take the stairs of St. Louis to reach the upper built on rock San Jordi with the chapel of the same name . Allow one or two hours visit with a stop at the village of Dhuilac , beautiful medieval village where you will find a good restaurant in a fine dining or simply refreshments after this invigorating cultural getaway. All relevant information on the Cathar castles you will be given at the campsite or at the House of the Cathar Country Pyrénees , tourist office adjacent to the camping Le Moulin du Pont d’ Alíes . 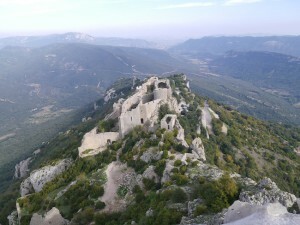 Tags : Chateau de Peyrepertuse, near Dhuilac campsite , campsite Cathar castles, camping Aude, Languedoc Roussillon campsite, pyrenees campsite.